Some stories are a wee bit of a stretch o'reality, some are outright fabrications .. and then there's ones that simply can't be made up, they're too good to be anything but, well, but what really happened. Back In The Day .. when Full Tilt Poker was one of THE places to play online ... in a $5 tournament awarding t-shirt bounties that read, "I knocked out a Full Tilt Poker Pro," Jeff won a shirt for eliminating Erick Lindgren. Fast forward more than a few years to here, TVPokerRoom, today, just a few moments ago. Day is in Seat 1 at table 7, Seat 2 is open and who comes over to claim the open seat??? Wanna see the t-shirt? 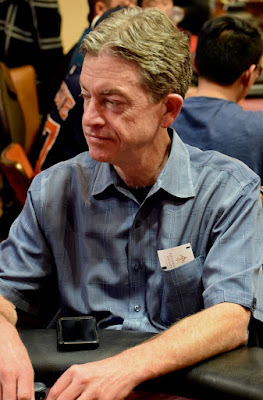 You have to wait, Jeff is still grinding Day 1A and it is his undershirt ... photo coming after Level 15.